1. Ski Classics Rules and Regulations are valid on top of the FIS rules (ICR). Athletes must act in accordance to FIS (ICR) and Ski Classics rules and regulations. a Ski Classics appointed Race Director is responsible for and has the right to amend the Ski Classics rules and regulations. b Ski Classics Race Director has the right to act upon violations of the rules. c Ski Classics Race Director is part of the competition jury. 2. Athletes must be registered as a member of an official Ski Classics Pro Team and have a valid FIS-license in order to compete for Ski Classics points and prize money. Application to register a Pro Team must be sent to racedirector@skiclassics.com. Points to include in the application, in Appendix 9. Ski Classics has the sole right at own decision to hand out a Pro Team License, which gives the right to register a Pro Team. a The athlete is registered in a Pro Team. b The athlete has an individual ranking that ensure a place in the elite group. c The athlete has a valid FIS license. d The athlete is registered before 30th September 2018. 4. Pro Team must be registered no later than 30th of September 2018 via www.skiclassics.com. Athletes must be registered in a Pro Team latest 48 hours before an event in order to receive Ski Classics points and prize money. Athletes need to be registered for the event according to event entry rules. Pro Teams registered after October 1st will not be guaranteed a place. Number of Ski Classics Pro Teams is limited to 25. Top 15 Pro Teams registered previous season in Ski Classics are guaranteed a Pro Team license if registered before 1st of September 2018.
a Registration of athletes to Ski Classics events is done when registering a Pro Team at www.skiclassics.com, registration is open until 30th September 2018.
b 2018/2019 the registration fee is Euro 80 per athlete and event. c Registrations after 1st of October 2018 are made directly to each event according to each events own rules, no start place is guaranteed and late registration fees may be different then in point A above. d Ski Classics will invoice the total registration. 5. Pro Teams must consist of minimum four and maximum ten athletes.There must be athletes of both genders in every team. 6. Athletes are not allowed to change Pro Teams during the season, and Pro Teams are not allowed to unregister athletes during the season. The season is defined as 15th November 2018 until 1st May 2019. 7. The Pro Teams should have a written agreement with the athletes in the teams in order to ensure that they accept the rules of Ski Classics, including the Anti-Doping agreement in Appendix 8a. The anti –doping agreements should be scanned and emailed to racedirector@skiclassics.com no later than 1st November 2018.
f Possibility to acquire VIP hospitality tickets to the Ski Classics VIP-trailer. 9. All Ski Classics athletes and Pro Teams must participate in the price ceremony at the Ski Classics Final banquet in order to receive prize money. If an athlete cannot participate in the Ski Classics Final due to illness and/or reasons beyond the athletes control, the athlete must submit documentation stating clearly the reasons for not attending. The document must be certified by a medical doctor and submitted to the Race Director in order for her/his points to be valid for the overall results. Prize money from Ski Classics will be paid upon invoice. Amount must be stated in EUR. 10. Event price money and VIP renumeration should be invoiced the event by each applicably pro team, by the latest May 30th 2019. Invoice should be sent according to the financial details in Appendix 10.There will not be any price money or VIP renumertation at the Prologue weekend. 11. 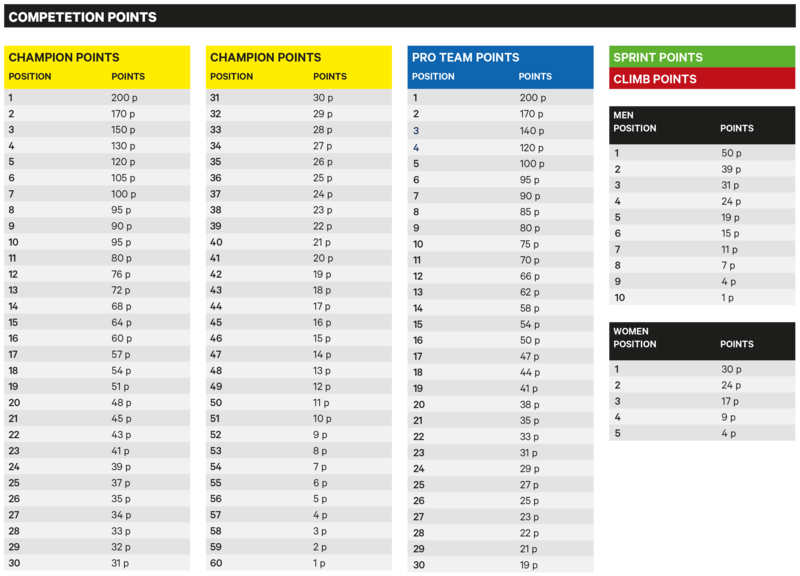 Ski Classics points are awarded according to the points table below. 12. Ski Classics Race Director may retain collected Ski Classics individual and/or Pro Team points if an athlete is violating rules in an event. A protest must be handed in to the Race Director within 60 minutes after the winner finishes the event by handing over to the Race Director or Jury a written protest, or emailing to protest@skiclassics.com, protest are handled according to FIS ICR-rules. All results are final one hour after the event winner has finished and the jury and/or race director has checked protests. Exception will be made for doping violation cases. b Pro Team members and team captain must be present a press conference if they are invited. c Available for questions from media immediately after finish and after the flower ceremony. d Top 3 finishing men and women + bib holders must be present in ProTeam Zone until Flower ceremony is completed. 14. An athlete must finish the race in order to receive points in the Champion or Youth competition. In order to receive Sprint or Climb points, the skier must finish the race. 15. In the event of a dead-heat between two competitors the points for the places will be added together and divided by two (e.g. in a dead-heat for 1st and 2nd places, both athletes will receive (200+170)/2 = 185 points). If the athletes are still equal, two (or more) Champions will be awarded. The prize money for the places will be added together and divided (e.g. in a dead-heat for 1st and 2nd places, both athletes will receive the prize money of the 1st and 2nd place divided in 2. 17. Each Pro Team participating in a Ski Classics event shall have a representative at the race´s Team Captains meeting the day prior to the race. The meeting is held at 16:30 local time unless otherwise stated from the race organizer. 18. Ski Classics athletes mandatorily have to wear provided bibs. They additionally have to use the provided GPS device if selected. 19. If bib a holder doesn’t start at the event or the athlete holds more than one bib, the highest ranked available athlete in each bib competition will wear the bib. 20. Ski Classics official pro teams shall have a Ski Classics pro team logo on their homepage, hyperlinked back to www.skiclassics.com. Ski Classics official Pro Teams shall use Ski Classics common top header menu on their homepage, html code is provided by Ski Classics. 21. Ski Classics and the Events part of Ski Classics may use photos and videos of registered Pro Teams and athletes in order to market Ski Classics with prior permission or remuneration. 22. Top 10 men and top 10 women in the SC ranking are considered as the Ski Classics VIP. Event organizations are obliged to pay as per below if event is cancelled later than 7 days prior to the race day. In order to receive the below VIP remuneration the athlete must be present at the event and attend the press conference, prize/flower ceremony if invited. VIP group athlete will receive EUR 195 + VAT per athlete and event. 23. The Pro Team Prologue race is organized as an interval start competition with block starts, one Pro Team is starting at a time in reversed order according to the Pro Team ranking. The gap between the blocks are 3 minutes. 24. The finishing time of the 3rd rakede male of the team will count for the classification. All Pro Team female ahtletes start in a pursuit calculated on the total male time, if there are more than one female athletes in a Pro Team, they start together at the same start time. First female athletes to finish the pursuit decides the result of the Pro Team Prologue. Pro Team Prologue points are handed out according to the table in Appendix 3. Minimum 3 skiers per team on the Pro Team Prologue must start in order to receive Pro Team Points. 25. If the Pro Team doesn’t have 3 men athletes on the start line, the Pro Team female skiers will start 30 seconds after last female in the pursuit. If no female is starting in the pursuit the pro team will be placed after the last female skiers finishing the pursuit according to the male Pro Team time. In the female race, the race director can decide to use wave start. 26. All Pro Team ahtlets starting and finishing within 20% of the winning time in the Pro Team Prologue will get 50 individual bonus points in the champion bib competition. 27. Women Competition Mass Start with seeding according to current ranking. 28. Men Competition Mass Start with seeding according to the current ranking. The men competition starts after the womens competiton has finished. 29. 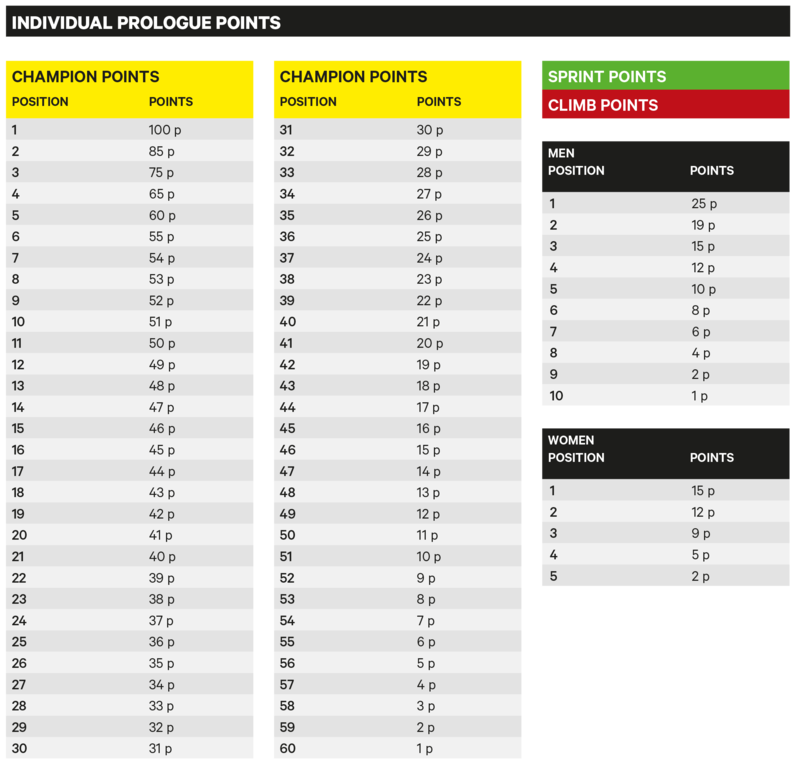 Individual champion, Sprint and climb points will be handed out according to the individual Prologue points table below. Pro Team points are handed out in ordinary values.